If you have an interest in taking your trading to the next level then it would be extremely prudent and in fact paramount to acquire the proper education from the best source available. When searching the internet for 'FX trading courses' you will find a plethora of online academies, FX tutors as well as thousands of YouTube videos and tutorials. This can be especially daunting and therefore can become very overwhelming especially to a beginner. Unfortunately the internet is riddled with a LOT of scam artists and charlatans looking to just take your money with get rich quick scams. As with anything in life, when you are looking to become an expert in a particular field, the BEST plan of action is to select the greatest mentor possible from a reputable background and proven track record within their field. To illustrate this point further, if I had any resources available at my finger tips and I was looking to become a bodybuilder, my first choice would be Arnold Schwarzenegger. If I was looking to become a world class chef and I could choose anyone, I might choose Wolfgang Puck. Well the same applies for trading. If I was to search for the best mentor possible I would choose a professional from the top trading floor in the world. In this case it would be Goldman Sachs. I would then select the best trader from Goldman Sachs with a proven track record. In this real life example the person I am talking about is Anton Kreil. Anton is a multi-millionaire professional trader formerly of Goldman Sachs and JP Morgan European Trading Desks. He is widely recognized as one of the best traders of our generation globally. Anton managed proprietary trading books of up to $500mln within Investment Banks and retired at the age of 28 in May 2007 just before the Global Financial Crisis. Anton also starred in the BBC series Million Dollar Traders in 2009 and in response to the thousands of messages he got from around the world asking him to teach trading, he began teaching and Mentoring Retail Traders in 2011 through the Institute of Trading and Portfolio Management. online so that anyone globally can get access to his education. The PTFM Video Series is designed to help Retail FOREX Traders globally, so they can emulate the strategies of Professional Traders at Investment Banks and Hedge Funds in their own Retail Brokerage Accounts. This approach is designed to foster consistent profitability over the Long Term. The PFTM Video Series includes 29 videos, spreadsheets and PDFs applicable. Here is the good news. For anyone who is serious about becoming a professional FOREX trader or just wants to trade their own money like a professional, Mason Dean Capital offers the course at a 10% discount. Not only that but once you start trading with Mason Dean, you will receive rebates every month until it covers 100% of the course! This ultimately means that so long as you keep trading the course price is FREE! Invest in yourself. Learn to trade like a professional today! The US dollar is on the back foot, with EUR/USD touching 108 and USD/JPY breaking support. President Trump’s travel ban – and his associated decision to fire the acting Attorney General – dominates sentiment and remains good for Treasuries, the yen (and gold), but bad for bonds and the dollar. How long will market sentiment to be affected? How far can the dollar and yields fall on this? I’m not sure serious analysis is possible, and I don’t trust my gut instincts on something as far from the usual state of affairs, but my bias is still that we’ll get back to the Trump economic program, and the implications for Fed policy, before too long. More prosaically, markets will focus on the US jobs data due Friday. 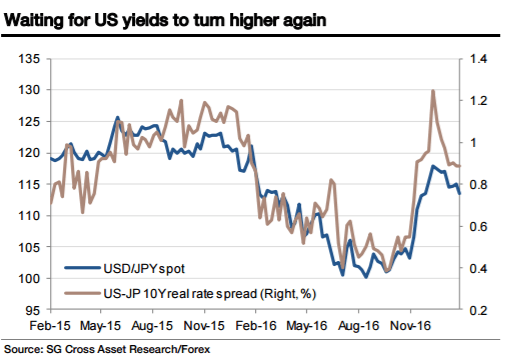 We still want to fade this bout of Yen weakness too, with the BoJ holding policy and still anchoring yields. This till leaves me looking fondly at long EUR/JPY as an idea, even if we still think it is 2 1/2 months too early for that trade really. Dealing Desk Vs. Non Dealing Desk is always an ongoing debate in the FOREX world. Non Dealing Desks are split between Straight through Processing and ECN (Electronic Communication Network). ECN is different than STP as Straight Thru Processing (STP) brokers simply place your trade order to the next counterparty which can be all of the three types of brokers: ECN, Market Maker or again STP. (2) FOREX Brokers are out to get the client by stop hunting and that client losses go right into the broker's bank account. This is the LARGEST misperception. The market maker broker (For instance Gain Capital) takes all its clients positions and form a large single net position which is then taken in or out of the pocket or hedged with other counterparty. It is the recommendations of Mason Dean Capital to use a market maker such as Gain Capital for all retail FOREX trading. Now that the election is over and Trump will be president in 15 days, we can focus on the implications of a Trump presidency. Donald Trump aims to shake up the US political establishment, which could potentially have a large effect on market volatility. During 2017, the key economic policies set forth by Trump will have an impact on various key financial markets such as US Dollar, Euro, Yen, Pound and other important currencies as well as stocks, commodities and bond markets in the event of victory. IB and CTA relationships are important to understand in terms of the potential benefits to both parties concerned. The number one benefit for the CTA is the Introducing broker's resource to a pool of existing customers and their ability to pass on these customers to the CTA. This alone is a good justification for the CTA to form a relationship with the IB and therefore a viable mutual relationship. The CTA increases their customer base and the IB is able to generate more commissions. Business extension is a distinctive reward and a reason why It is wise for the CTA to consider an established Introducing broker. When a CTA partners with an IB it expands their reach and sphere of influence. The IB is about the closest thing for the CTA to opening up a new office. This recognition of expanding influence is a two-way street as well. When treating Introducing Brokers as an extension of the CTA Business,the IB's Development team will work harder for the CTA more so than any other broker they have an agreement with. Saving time by allowing the IB to take care of any issue/s that arise. Commission Rebates can be a big plus for obvious reasons. In certain circumstances IBs are able to offer a commission rebate back to the CTA. Since the IB is compensated each time their client makes a round turn trade, some IBs, especially those with a large enough client base, will offer their CTAs a rebate on every trade they make. Many CTAs use this trade rebate as an instrument to preserve their capital, and others look at it as a way to tighten the spread. Regardless of what angle the CTA look at from, it’s free money to receive on every trade. Yes, FOREX/Currency trading can be very risky especially if not exercising proper risk management and money management. Substantial losses can occur. A beginner trader must especially be very careful when trading these markets. Welcome to the MDC FOREX educational blog. For those thinking about starting off in the exciting world of FOREX trading please take note of the information below as it will drastically help you reduce your risk. Having said this, It is important to know that this does not mean you are guaranteed to start making money out the gate but will at least help you open your eyes to the pitfalls. Just like anything in life, when entering into a new venture, education is paramount to your success. The more information you have, the more likely you are to succeed. FOREX is the largest market on earth surpassing 4.5 Trillion traded daily (according to the Bank of International Settlements). Therefore, it is an extremely liquid market that allow high amounts of leverage. However, over the recent years, the US has restricted leverage down to 50:1 (down from 200:1). This is a good thing as it is a terrible idea to use 200:1 leverage. One of the main reasons why Lehman Brothers collapsed is because they were 44:1 leveraged. Leverage is great when markets are in your favor but only takes ONE catastrophic event to wipe you out (even if you are a multi Billion dollar investment bank as Lehman Bros.). Mason Dean Capital have a genuine passion and interest in educating their traders in order that their customers can stay alive in the market and trade a lot safer and smarter. To get started with this educational series, Mason Dean Capital have compiled a few tips for you to get started. Please subscribe and follow the blog posts to keep updated with important news, tips and educational material. You can also check the educational portion of the Mason Dean Capital web site. Forex Education Tips. Below are five quick tips to get you started. In the upcoming series, there will be plenty more of tips and tricks. 1. The FX market offers 50:1 in the US. Here at Mason Dean Capital, we do not recommend exposure of more than 10:1 Maximum. In fact, we recommend only using around 7 or 8:1 leverage. I.e. with a $10,000 account do not trade more than $100,000 in currency at any one time. 2. Long Term Vs. Short Term. There are multiple options for how long to hold a trade from both spectrums of short term and long term, I,e, you have High Frequency trading, Day trading, swing trading, long term trading etc etc. However, for purposes of this tip, I have broken down into two main philosophies in trading – Long term and short term. Some traders will swear that long term trading is the way to go and others will promise you that short term is a much better approach. I have personally spoke to ex-Goldman Sachs traders who have been very successful with longer term trading as well as high profile hedge fund managers who have had success short term trading. So do you trade long term or short term? The best advice I like to give, is to first educate yourself in both styles and then pick the method that best suits your personality. It is important to not get confused which direction to go with but instead learn as much as possible on the pros and cons and methodology behind each approach. 3. Plan you trade and trade you plan! No matter what, once you are ready to start trading, you have to have a plan of action set in place. It is a cliché but very true to say that if you fail to plan then you plan to fail. ALWAYS have a strategy in place before executing a trade. This means an initial entry point, take profit price as well as an idea of where you are looking to exit with a loss. Once you have these parameters then you are in a position to act mechanically and it helps to eliminate the emotional part of trading. I.e. entering the market on a hunch or a whim and then using emotion to drive you decision. This is a recipe for disaster! ALWAYS Plan your trade! 4. Do NOT execute a trade unless you have checked your news calendar. There is nothing worse than entering a trade, seeing some profit to start building and then all of a sudden seeing your position tank out of the blue due to a significant news announcement relating to the currency pair you are trading. Therefore, make sure you do not trade during any news event. A good site to go to would be http://www.myfxbook.com/forex-economic-calendar. This will show you exactly what date and time the announcement is going to be made. I recommend NOT trading during any “High” impact news event. We hope these tips will at least give you a little nudge in the right direction.